Would have been nice to see Kia offering a performance sports coupe. "There is nothing in the plan right now for that. The Stinger GT sedan is the big focus in terms of really strong performance,” he said. "It’s our halo vehicle. It was the right time to bring it two years ago and it’s doing really well. It also has this great brand-building effect for us.” But what about the GT4 Stinger coupe? Could a production version potentially become a future rival for, say, the new Toyota Supra? "There are no plans for any other sports vehicle at this stage.” What about an all-electric variant? "Again, no plans at this stage,” we were told. The GT4 Stinger concept was a stunning concept design study and that’s it. There was a time, perhaps, when Kia considered production but the brand’s focus is apparently elsewhere these days. Prior to the new Supra, Toyota didn’t really have an enthusiast high-performance sports car (the 86 isn’t exactly "high-performance”). 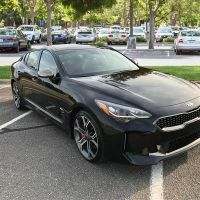 However, the Stinger GT fastback has quickly become Kia’s enthusiast image builder, and so it makes little business sense to launch a coupe variant. There’s no question Kia’s design studio could easily handle the task, but the business case just isn’t there. Thats too bad. The 3.3T would make a potent engine for any sports coupe. Too bad, I'd like to see the twinturbo V6 engine and the 8sp transmission in a much lighter package (at least half a ton lighter, literally) with only 2 seats, RWD, and a chassis and suspension design ala Corvette (no McPoverty struts please). Even better, couple the engine to a 6-7sp manual.